When Conrad and Butler decide to take a vacation, things don't go quite as planned. A newly married couple tries to enhance their social life by throwing fabulous parties and inviting all their friends in Brooklyn to their home. Claude: Did she poop in her pants? Margot: It happens to everyone, not just babies. It will happen to you too someday. First of all: "Margot at the Wedding" is not a comedy or a chick flick, as the distributors wanted you to believe - hence, the movie being a major box-office flop/critical failure. Noah Baumbach's follow-up to his endearing, critically acclaimed "The Squid and the Whale", is just as good as his previous film, but much darker and mature. Margot (Nicole Kidman, in her first good film since "Dogville" - this is her comeback, too bad most people didn't get it) and her son Claude (Zane Pais) go visit Margot's estranged sister, Pauline (the always wonderful Jennifer Jason Leigh), who's about to marry a not very distinctive type (Jack Black, okay for the first half of the movie, but shows no drama skills at a pivotal scene - his performance being the only major letdown in the movie for me). It won't be an easy time for any of them. Baumbach could've done something lighter and gotten another critics' fave like "Whale", but thank God for real auteurs, he did something different, and succeeded on it (at least, in my books!). 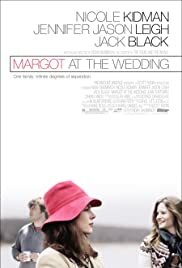 "Margot at the Wedding" is, right from the title, a homage to Éric Rohmer ("Pauline at the Beach" - by the way, Baumbach's movie was entitled "Nicole at the Beach", but they had to change the title when Kidman was cast), with similarities to Bergman ("Persona", in particular) and Woody Allen's more serious films ("September", for instance, which were already inspired by Bergman). Baumbach's writing is fantastic, very quotable and personal, and the cast got the idea and did a remarkable job (except for Black). A misunderstood gem. 9/10. 39 of 65 people found this review helpful. Was this review helpful to you?